This is an oldie but goodie. 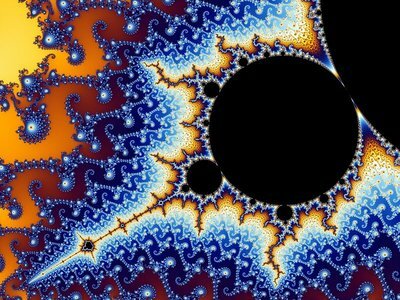 I’d like to show you a shape that is infinitely complex and also very beautiful, known as the Mandelbrot set. Regarded from a distance, it looks like a bug with little bugs budding off of it. So what’s so beautiful? Zoom in anywhere along its edge and breathtaking patterns emerge. Most remarkably, you’ll continue to see repetitions of the original bug, but with variations. Here’s a bug that is a bud off a bud off a bud off I-don’t-know-how-many other buds. For the full sequence that got us here, visit this site. The repetition and complexity continue literally forever! Amazingly, the set is described by a simple equation: Zn+1 = Zn2 + C. Don’t worry if you don’t know what that means for now. The only point is that it’s simple, yet it produces an object of infinite complexity. How beautiful! Let’s look at some videos. The first video has some baroque music to match the baroque nature of the set, so turn on your speakers! At the beginning, notice how the bugs repeat. There’s a transition to a seahorse patterns that repeats with variation as the magnification increases, and finally an unexpected bug at the end. Here’s a video that zooms in on another area. By the end, the magnification is so extreme that the original picture would be larger than the entire universe – and the complexity continues unabated. To introduce the idea, consider what happens if you multiply a number by itself umpteen times. Let’s say the number is 2. You’ll get 2, 4, 16, 256 and so on. If you were plotting those number on the number line, you’d bounce along toward infinity. However, if you were to start with 0.1, you’d get 0.1, 0.01, 0.0001, 0.00000001, trending toward zero. 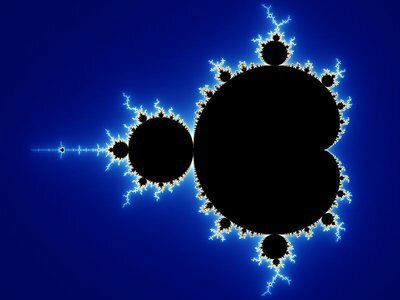 The Mandelbrot set multiples and iterates with a different sort of number called a complex number. If you’re interested in the details, please visit the links below. For now, suffice it to say that while a normal number is placed on a number line, a complex number is graphed on a two-dimensional plane. If you add or multiply complex numbers, you get to a different point on the plane, instead of a different point on the number line. If the iterations don’t fly toward the infinite distance on the plane, then the complex number you started with is a member of the Mendelbrot set. If they veer toward infinity, then they are not members. On the videos, the different colors correspond to how quickly they fly off. Here’s the best series of videos I’ve found that explain it all. This entry was posted in Beauty, Inspiration and tagged Beauty, Inspiration, Mandelbrot, Math. Bookmark the permalink.